Since 1982, when the owner started an instrument repair business from his home, our repair shop has been bringing you quality, full-service in house repair from certified technicians. We work hard to keep our service personal, affordable, and expedient. We back our repair work 100% for approved brands. 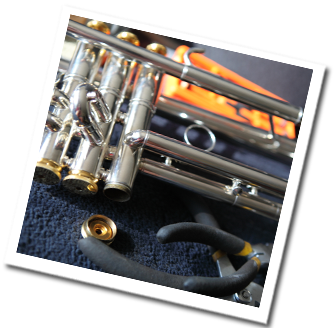 You can call or stop in and talk directly with one of our repair technicians about your instrument. No appointments are necessary. As part of our repair service, an REW Team member visits most Kansas City area schools each week to ensure the music educators and students remain properly equipped to further their music education experience. Care and Maintenance is important when learning to play and instrument. Click here to learn more about how to care for your instrument. Buyer be ware!!! ISO's are becoming more common as internet sales and box stores try to join in the market of music instrument sales. Unfortunately, these ISO's or Instrument Shaped Objects as we affectionately refer to them, are no more than a glorified toy when it comes to the success of your students music education. They generally look like the real deal, feel like the real deal and might sound like the real deal at first. However, in a short amount of time these ISO's begin to literally fall apart and not play properly. Sometimes this even happens with no visual cues which leaves the student feeling frustrated because they think they "can't do it" consequently leading the student to quit all together. Beginning students and their parents are generally the most vulnerable to the "good to be to true" ISO sales. ISO's are instruments that are made from knock off manufactures who use low grade materials and poor assembly. Repairing theses instruments is next to impossible and if the repairman can work a miracle it will cost you exponentially more. The good news is... we have found a solution and a good use for these ISO's... they can be used for anything from decoration to model rocketry. In fact, we found ourselves in possession of an ISO and weren't sure what to do with it. See the video below showing the fun we had turning the clarinet ISO into a model rocket. Wells Elementary School Band - Beware of Instrument Shaped Objects!!! Our instrument donation program is a way that we are able to partner with you to give back and provide the gift of music to someone who might not be able to otherwise afford it. This is a program that we actively and quietly pursue so that we can preserve the dignity of the students that are receiving the gift of music. We feel that this program is not about those that are giving but about those that are receiving the gift. Together with your support of instrument donation we are able to provide students with an opportunity to pursue and obtain the joys of music with pride. We are always accepting donations at either of our location. You do not need to set up a special appointment or go through any special process. You can simply bring your instrument to us at either our Lenexa or Olathe store. We will send it through our repair department for a thorough inspection, clean-up and properly prepare it for a young musician who might not otherwise be able to afford it. We thank you for your support and look forward to partnering with you to help provide the gift of music. Click here to learn more about our Play It Forward program.